Home / Posters / The Films: 1980 / View The Original Brazilian 'Friday The 13th' 1980 Poster In Portuguese! 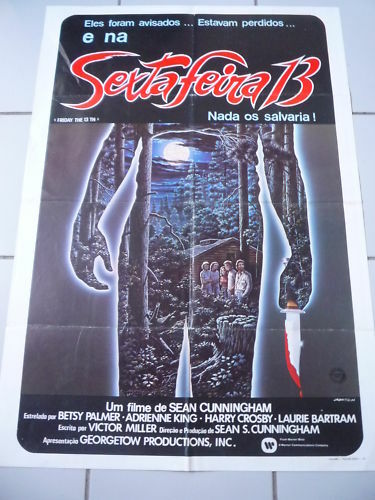 View The Original Brazilian 'Friday The 13th' 1980 Poster In Portuguese! One of the goals of our website is to explore and showcase rare international marketing materials produced for the Friday the 13th film franchise so U.S. fans of the films then have a better idea of how people around the world perceive the slasher series to look like. The real bonus of this goal for long time fans is to witness rare images that they have never seen before. Today we showcase the Brazilian one sheet for Friday The 13th 1980. The title on the poster utilizes the Portuguese language for which "Sexta Feira" translates to "Friday" in English and coupled with the numbers 13, spell out the title of the movie. Only posters created in the U.S. for the Friday the 13th films use "th" after 13. Surprisingly, this exclusion of the "th" is often mentioned as a mistake by fans, but in reality is truly correct when used in other countries. The tagline for the film wraps around the title as such: Eles foram avisados... Estavam perdidos... e na... SEXTAFEIRA 13... Nada os salvaria! The translation into English expresses the exact same tagline as the U.S. phrase, which of course is They were warned... They are doomed... and on Friday the 13th, nothing will save them. Keep an eye out for more rare posters like this one to be displayed on the website in the near future. If you have any posters that you find and would like to display them on our site, please post in the comments below or send us an email at contact@fridaythe13thfranchise.com!